In frosty February 1975, molecular biologists gathered at Asilomar (California, USA) for a conference going down in history. Following the recombinant DNA revolution, the ethical usage of recombinant DNA in research was discussed. Many aspects of this gathering foreshadowed issues that the child of recombinant DNA technology, synthetic biology, is struggling with nowadays. Asilomar helped shape recombinant DNA technologies and bring them into the public eye by bringing together the researchers involved in this topic. In sunny October 2018, about 100 synthetic biologists from all over the world gathered in Toulouse, from Master’s students all the way up to distinguished professors and leaders in the field of synthetic biology. 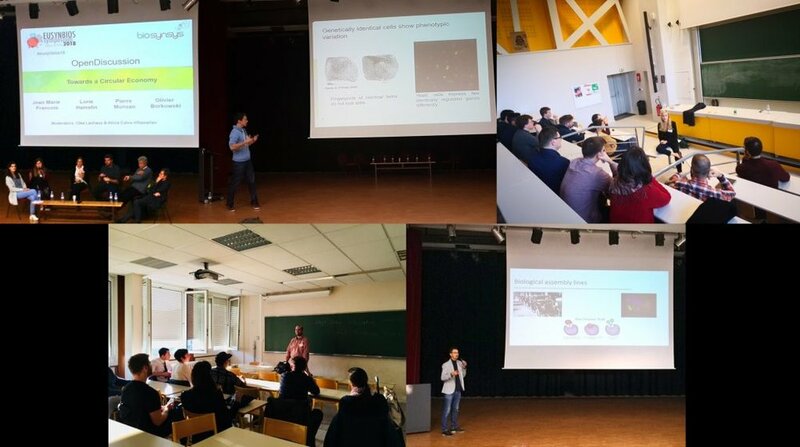 In a meeting jointly organized by the European Association of Synthetic Biology Students and Post-docs (EUSynBioS) and the French Research Group on Synthetic and Systems Biology (BioSynSys) at the Institut National des Sciences Appliquées de Toulouse (INSA Toulouse), scientists had the chance to engage in fascinating presentations and discussions with their peers. This joint meeting was a first for both organisations and has shown the potential of collaboration between local and international scientific organisations to foster connection, exchange of ideas, and collaborations. 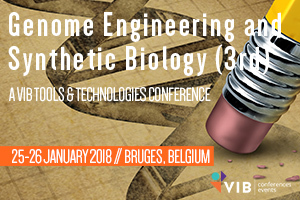 During four days, leaders of synthetic biology such as Prof. Dr. Sven Panke from ETH Zurich, Prof. Dr. Beatrix Suess from TU Darmstadt or Prof. Dr. Jérôme Bonnet from the University of Montpellier explained their latest advances in very diverse areas of synthetic biology to the audience. Additionally, many young researchers had the chance to present their research in oral presentations and posters. Led by the idea of a circular bioeconomy powered by synthetic biology, which was illustrated by a keynote presentation by Dr. Lorie Hamelin and an open discussion with leaders in the field. This meeting in Toulouse gave to young as well as to established researchers a potential way forward in our climate change-endangered world. Another way forward was illustrated in workshops conducted during the conference. Dr. Konstantinos Vavitsas discussed the important longstanding issue of standards in synthetic biology with the participants, Nadine Bongaerts prepared them for conversations with the public through science communication and Dr. Pablo Ivan Nikel led a career development workshop to ensure the success of the young researchers present. Accompanied by delicious French food & wines, our participants thus had plenty of exciting science around them, which would have turned the Asilomar participants green with envy! Yet there is an additional parallel with conferences such as Asilomar: organization, representation and the determination to bring the topic into the public eye. Next to EUSynBioS, national associations for synthetic biology such as the German Association for Synthetic Biology (GASB), Synthetic Biology Canada (SynBio Canada), Synthetic Biology Australasia (SBA), Synthetic Biology UK (SynBio UK) and the US-based Engineering Biology Research Consortium Student and Postdoc Association (EBRC SPA) also presented their organizations and plans for the future. 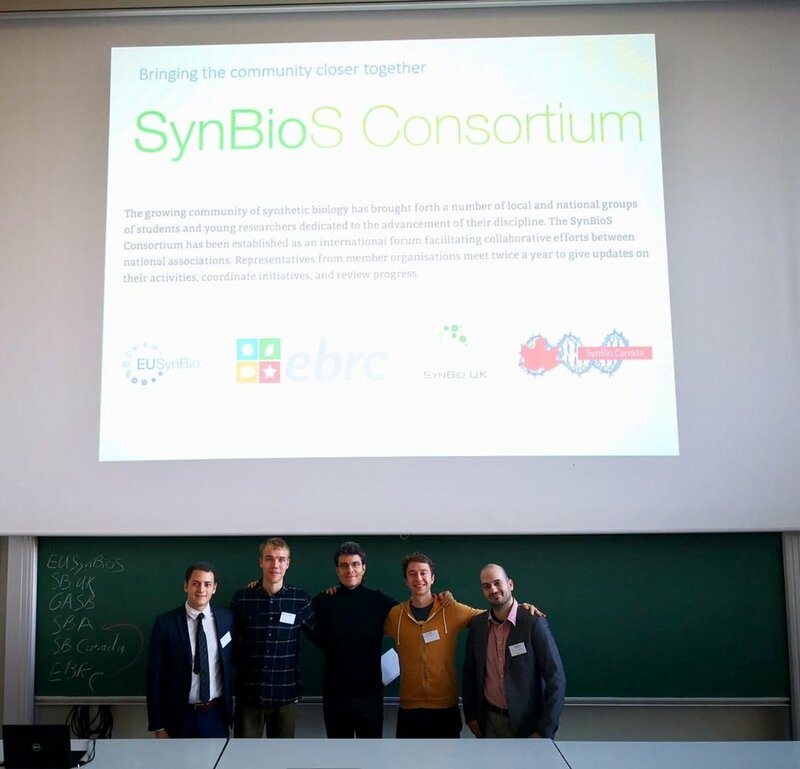 With the aim of constructing a worldwide SynBioS Consortium to help coordinate initiatives and strengthen the ties between countries and continents, the national associations exchanged information and engaged in fruitful discussion. Analogous to Asilomar, meetings such as this symposium in Toulouse helps to shape the development of synthetic biology, both within as well as without by modulating its interaction with the general public surrounding it. This is particularly important nowadays, in a world endangered by climate-change and in which scientists and synthetic biologists need to bring forward new solutions to solve humanities’ most pressing challenges. After four days of intense engagement on every level, the participants travelled back to their respective countries, enriched in knowledge, connections, and experiences. If our participants have even a fraction of the satisfaction we have with the event then we can consider it as a major success. See you at the next synthetic biology symposium! Daniel Bojar and Adam Amara are EUSynBioS steering committee members. Alicia Calvo-Villamañán is a member of the student committee at BioSynSys. Our friends at the Young European Biotechnology Network hold their second round table event this September, join them! YEBN'S 2nd Round Table is going to take place in Frankfurt, Germany. When? Saturday 9th of September. Here you could find an exciting one day program to exchange between different local and national life sciences organization within Europe in terms of activities and structure (sponsoring, working groups etc). We will also inform you about European supporting programs such as Erasmus +.